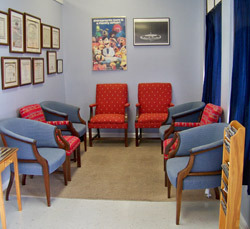 You can always make yourself at home in our waiting area. Dr. Heaton will explain what chiropractic adjustment, physiotherapy and decompression means, so you will better understand what type of treatment you are receiving. He will also go over how long your treatment will take and what is the best way for you to receive your treatment. Always remember to ask questions if you are concerned about something or need an explanation; Dr. Heaton will be happy to answer any questions or concerns you have about chiropractic care.